It took years of exploring other art mediums, e.g. ceramics, glass, painting, stained glass, sculpture, jewelry, etc., before Greg decided it was time for a serious profession and joined the Navy for nine years studying electronics, to which he claims, "I couldn't do electronics to save my life!" He does however, credit the Navy for instilling in him the lifelong discipline needed to perfect and master the art of blacksmithing. Intrigued by viewing a KPBS-TV special program on blacksmithing, Greg began perusing library books for more information, which eventually led to volunteering at the Old Town Blacksmith Shop in San Diego. A friend invited Greg to attend the California Blacksmiths Association Annual Meeting where he met Richard Schrader from whom he began to learn the business side or "high-end" market of blacksmithing. A year later, Greg was allowed to share a shop with another blacksmith, Rick Ciardella, in San Marcos, California. Allowed to experiment, he made his first candelabras and sculptures, eventually helping with commissioned pieces of architectural metalwork. 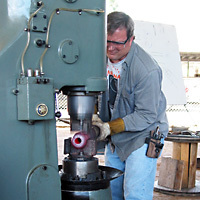 In addition, Greg's skills progressed to where he started teaching classes in blacksmithing at the University of California San Diego Craft Center. After leaving Ciardellas's shop, he worked as a fabricator for a company in San Marcos and learned production. Three years later, he and his wife Brenda began their own blacksmith business, "Greg Eng, Metalsmith" and built their own metalsmith shop behind their home in Vista, California. That first year consisted of mundane fabricating and small side jobs until he was commissioned to do front door handles and window grills for an estate in Rancho Santa Fe. Afterwards he progressively received commissions for more custom work. They built their business with brochures, by visiting job sites, and through word of mouth referrals. Ten years later his metalsmithing business is steady. Today, he is able to design 85% of his work and feels fortunate to be able to do this for his designers and clients. Greg's biggest challenge is to infuse as much of the blacksmith craft into the work while keeping within budget constraints. Greg and his wife, Brenda, have only begun to scratch the surface of his talents with each project. As a part of their husband and wife team, Brenda helps Greg with the designs as they work on concepts together. In addition to managing all aspects of the business, Brenda assists Greg with installations, finishes, and moral support. This family-run business receives commissions mainly from San Diego based designers, clients, and builders alike with the purpose to achieve an artistic statement in metal. 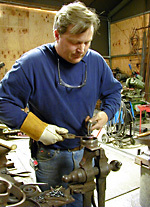 Published article "Greg Eng, Metalsmith" from the June 13th 2002 edition of The Anvil's Ring, by Lily Riviera.